Geri Raymond of Scottsdale takes a picture of Kylah Thompson, a fireman with the Durango & Silverton Narrow Gauge Railroad, on Thursday after returning to the depot. Narrow Gauge Day will be held Friday at the depot in Durango, and the first train of the year will depart Saturday to Silverton. The first trains to Silverton this year will pull out of the station Saturday morning. The Durango & Silverton Narrow Gauge Railroad will celebrate the occasion on Friday with its Narrow Gauge Day event. A free barbecue picnic will take place at the train depot from 11 a.m. to 2 p.m., said Christian Robbins, director of marketing. The Bar D Wranglers will play live music. There will also be train cars and railroad equipment on display. The first trains will leave Durango at 8:45 and 9:30 a.m. Saturday. Riders will be treated to narration about history of the train and the area. Bookings are up 12 percent from last year, Robbins said. “We’re pretty optimistic and pretty excited about this summer given where we’re at,” he said. Arrival of the first train transitions the sparsely populated town of Silverton into the busy tourist season, said Grand Imperial Hotel Manager Jaime Ferry. It is a shot in the arm for the local business owners, said DeAnne Gallegos, executive director of the Silverton Chamber of Commerce. “Train season is a vital anchor to our summer economy,” she said. Last year, the D&SNG served 156,050 passengers, which includes regular train passengers and special event trains. This year, the railroad is expected to break the 200,000 passenger mark. 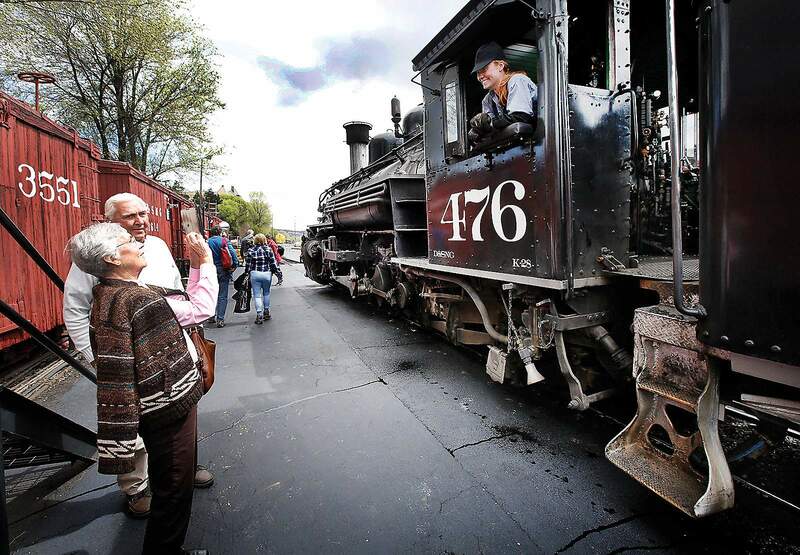 On its busiest days, the railroad will run three to four trains between Durango and Silverton. On peak days, the railroad will carry 1,200 to 1,400 passengers on multiple trains. Gallegos says the restaurant industry in Silverton is the beneficiary of large portion of train passengers’ receipts. “It’s being able to capture that audience, give them good service and have fast turnaround because next thing you know, another trainload of hungry passengers is coming,” she said. Gallegos also said that because train passengers stay for only a few hours in Silverton, they often make return trips by car the very next day. The Grand Imperial increases staff from about six employees in the winter to 30 in the summer, she said. The D&SNG runs to Silverton from the first weekend in May until the last weekend in October. This year marks the 20th anniversary that the railroad was bought by American Heritage Railways.